Available to all radio amateurs or short wave listeners-SWL who works/hears GPDX members or activities after 1994 on all bands and mode. Contacts on VHF or UHF in FM mode or via repeaters are not valid. 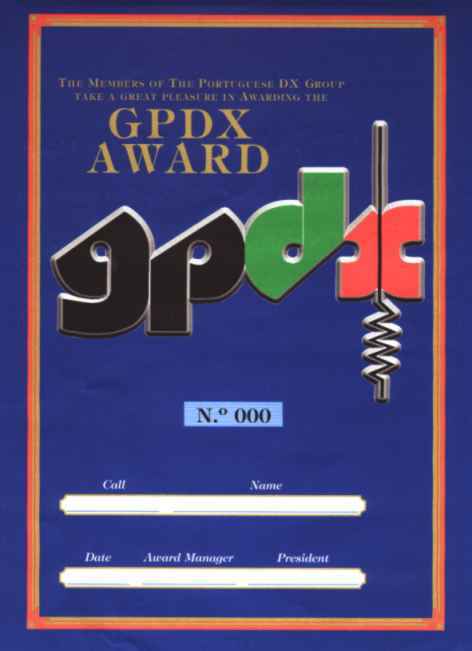 GCR list is acceptable with a signed certification by official of your Radio Club or two other licensed stations. Cost of award is , 8€ Euro, USD $10 or 12 IRC´s . *CT1AFN, CT1AGF, CT1AHU, CT1AIC, CT1AIS, CT1ALF, CT1APE, CT1AOZ, CT1ASU, CT1AUO, CT1AVC, CT1BGE, CT1BH, CT1BOH, CT1BOP, CT1BWT (SK), CT1BWW, *CT1BXH, CT1CBI, CT1CDP, CT1CFH (SK), CT1CHZ, CT1CLR, CT1CQK, CT1CTZ, CT1DGK, CT1DIZ, CT1DJE, CT1DTO, CT1DVV, CT1ECT, *CT1EDX, CT1EEN (SK), CT1EFB, CT1EFL, CT1EGW, CT1EHT, CT1EKD, CT1ELI, CT1ELP, CT1END, *CT1EOD, CT1EPV, CT1ERY, CT1EWX, CT1FEL, *CT1FUI, CT1GFK, CT1GWC, CT1KT, CT1YH, CT1ZS, CT2GOX, CT3DZ, *CT4DX, CT4HA, CT4NH, CT4SL, CT4VB, CU3AV, CU3EJ, CT1BNP, CT1BXX, CT1DNU, CT1DRB, CT1DWJ, CT1ESA, CT2ICS, CT5IDB, CT3EE, CT3FN, CT3KY, CT3LK, CU3AD, F6HMJ, G3KHZ, HB9CRV, HB9FMU, ON5UM, PT7BI, VA2AM, PT7ZXU. Other callsigns used by GPDX members: CQ - CQ1P, CQ2H, CQ7O (2001). CU - CU2F, CU2H, CU2W, CU3F, CU3H, CU3W, CU7F, CU7H, CU7W, CU8F, CU8I. Another PT7ZXU, ZW8M, ZX7U, ZX8M.